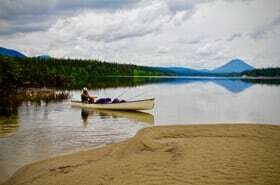 The Bowron Lake Provincial Park is now considered one of the most popular paddling adventures in the world. People from many different countries and all walks of life have come to our park to experience and travel the Circuit. In 1926, through the efforts of Frank Kibbee and the McCabe’s, the inside of the chain of lakes was declared a Game Reserve. Then, in 1961, this area was reclassified as the Bowron Lake Wilderness Provincial Park, named after John Bowron who was the Gold Commissioner at Barkerville. Bowron Lake Park is an unspoiled wilderness of 121,600 hectares with a unique system of connecting lakes, rivers, and portages. The lake lies at an elevation of 950 meters beneath the rugged Cariboo Mountains, which have an average elevation of 2,100 meters and form a scenic backdrop for this wilderness experience where wildlife abounds along the lakeshores and rivers. Bowron Lake Park is open between May and October, but July and August are usually the busiest. On a typical tour expect 5-6 days of sun and a couple of cloudy days with a few mountain storms, as well as a touch of frost in May and mid-September. All visitors must register with the park before heading out on any adventures. The Circuit Trip is 116 km in length and takes anywhere from 5-10 days. While most paddlers allow 7 days for their trip, those who are planning on doing some relaxing or fishing should allow for a 10-day trip to take make their experience much more enjoyable. The extra days will enable you to stay in camp for 2 days at a favourite spot and allows for the possibility of being storm bound for a few days. Guests who are planning on taking this trip should be prepared and well equipped. Being in good physical condition and having outdoor experience can make the trip more enjoyable; however, people of all skills and fitness levels have taken this trip with little difficulty. If you are thinking about taking this trip and are inexperienced, do some conditioning and practice before hand and make sure to purchase or rent only quality equipment. The trip up the West Side is a shorter and less strenuous trip than the complete Circuit Trip because the rivers are slower, the lakes are usually less windy, the portages are shorter, and the terrain is flatter. The sandy beaches and warmer waters also make this area great for swimming. Guests can travel counter-clockwise from Bowron Lake through the Spectacle Lakes to as far as Unna Lake and then return. At Unna Lake you can visit the Cariboo River Falls, which is one of the many highlights of the park. If you have time restrictions, your gear and equipment are not light weight, or if you want to avoid any portaging, you can travel as far as the end of the Spectacle Lakes and then return. 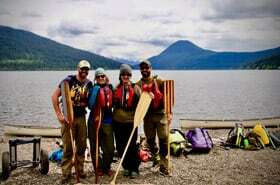 While Bowron Lake Park is a trip of a lifetime, planning is key to a successful and enjoyable trip. All guests are expected to pack everything needed as there are no services on the tour. This park offers nature’s best, so expect hot sunny days, wind, clouds, rain, or hail storms. Guests should plan to travel early and to set up camp by early afternoon to avoid strong wind. Campers who are planning on taking a trip around the park should consider packing two 30-litre buckets for food containers, as they are waterproof, easy to pack and stow in the canoe or bear cache, not too heavy, and make great chairs at the campsite. In most cases, two buckets, two dry bags, and a tent bag are all campers need for their trip; however, it is important to note that the park only allows 60 lbs/28 kilos in gear weight to be put in the canoe if you choose to travel with a cart during portaging. The rest of the gear must be carried by you. Heavy Duty Dry Bags (rental) are a great option for portaging. Campers should consider packing clothes in reusable waterproof bags and avoid using 40-60-litre totes and coolers as they are big, heavy, and awkward to carry. Make sure to balance what is needed with what has to be carried and that everything is in waterproof containers or dry bags.